Why does a denomination prohibiting women clergy support parishes run by women? Why does a denomination opt to ordain women when there are few women seeking to join that clergy? And why have some denominations ordained women so much earlier than others? 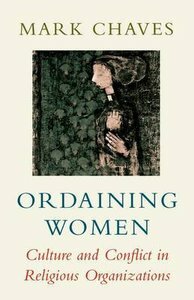 In a revealing examination of the complex relationship among religion, social forces, and organizational structure, Ordaining Women draws examples and data from over 100 Christian denominations to explore the meaning of institutional rules about women's ordination. Combining historical and sociological perspectives, Mark Chaves deftly shows that formal institutional rules about ordination often diverge from the actual roles of women and are best understood as symbolic gestures in favor of--or in opposition to--gender equality. Ordaining Women concludes that external pressures from the women's movement and ecumenical pressure expressed through interdenominational organizations such as the National Council of Churches influence ordination practices. At the same time, internal factors such as having a source of religious authority that is considered superior to modern principles of equal rights also explain why some denominations ordain women much earlier than others. Surprisingly, "the Bible forbids it" does not account for policies even among fundamentalists and other biblical inerrantists. Chaves' historical and comparative approach offers a revealing analysis of how the internal denominational debates have changed over time, becoming more frequent, more politicized, and more contentious. The skillful delineation of forces affecting debates and policies about women's ordination makes this book an important contribution to our understanding of religious organizations and of gender equality. Mark Chaves is Professor of Professor of Sociology, Religion, and Divinity at Duke University.